I feel a little like a dog with my tail between my legs showing my face around here. I hyped up this three-post series of fall pear deliciousness and then it takes me a month to post them. Lucky for me pears have a nice long season and this strudel is an impressive dessert with an equally impressive lack of preparation time. Just the sort of thing to serve after a cozy dinner of soup or as a slightly sweet snack while you are cooking Thanksgiving dinner. 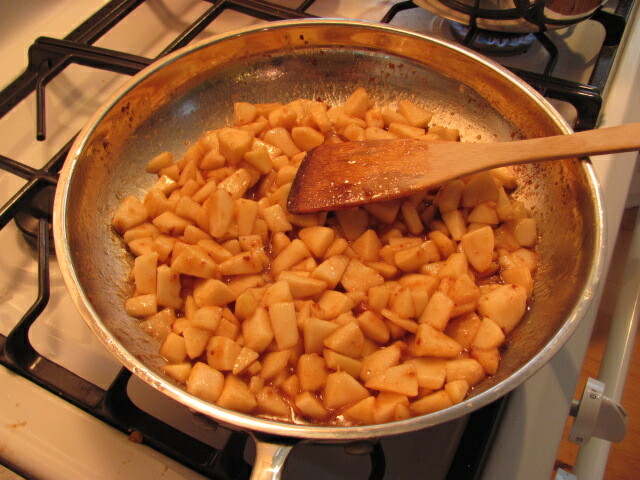 The pears cook down for a few minutes with a melody of warm spices until they are slightly soft and delightfully sweet. The puff pastry (either homemade or purchased) is filled with the pears and cooked until light and crispy on the outside. Dusted with powdered sugar and drizzled with a rum sauce this dessert (or breakfast) looks quite fancy but comes together in hardly any time at all. It really is a great recipe to have in your arsenal, in fact, I think it would be great filled with other kinds of fruit too. Bake until golden brown and crispy, about 20 to 25 minutes. 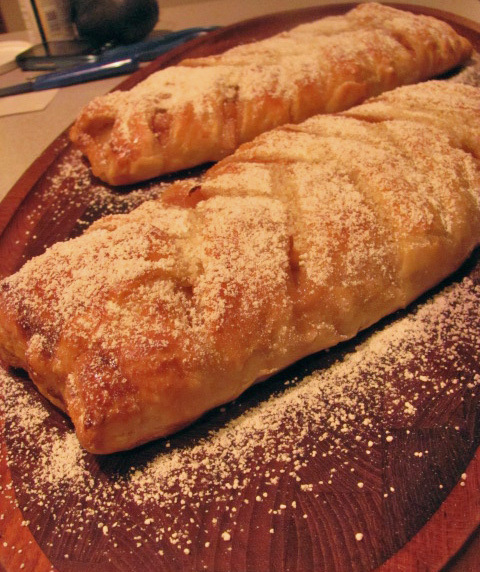 While the strudel is baking, heat up the remaining sauce over medium heat, add rum and 2 Tablespoons butter. When the strudel is done dust it with powdered sugar. Slice and serve with rum sauce on the side. This entry was posted in Dessert, Fruit, Recipe and tagged dessert, Fruit, Recipe. Bookmark the permalink.